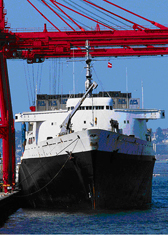 Home » Construction » Communication Cabling » Industrial Projects » Irving Shipbuilding Inc.
Irving Shipbuilding under went a complete communication infrastructure upgrade. FCC Communication Cabling worked around the clock during the shutdown, which lasted from Friday evening until early Monday morning. FCC’s goal was to upgrade the network hardware and to organize the structured cabling to work stations. In total 450 new communication lines replaced the obsolete data cabinets with a user friendly H-rack cable management systems. The process to reorganize these 450 lines involved a total of 1350 - 4 pair wire or 5400 single wire terminations.